Export-Import (Exim) Bank of India has extended a US $ 45.27 million credit line to Sri Lanka to upgrade and rehabilitate the Kankesanthurai (KKS) harbour as a commercial port. Treasury Secretary Dr. R.H.S. 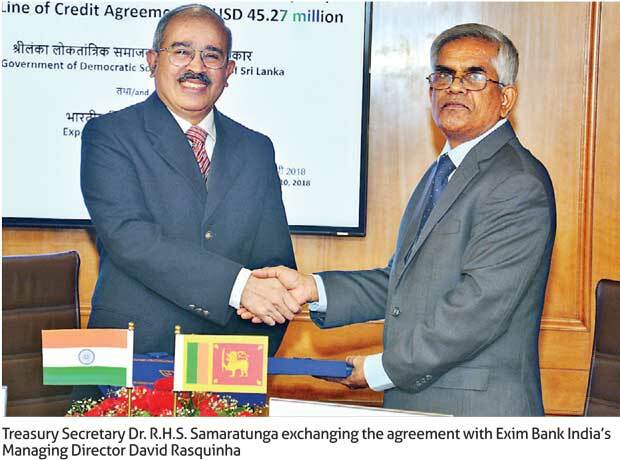 Samaratunga signed the loan agreement in this regard recently in New Delhi with Exim Bank India’s Managing Director David Rasquinha. The project is expected to help to further strengthen Sri Lanka’s effort to become a regional maritime hub in the near future. The Government of India is the major development partner of Sri Lanka in South Asian region over 40 years since 1973. During the last few years, Indian foreign direct investment in Sri Lanka has expanded exponentially. Presently, Indian development assistance mainly focuses on the improvement of economic infrastructural facilities, livelihood development, education, healthcare, capacity building and economic renewal of Sri Lanka. Both governments inked a fresh line of credit worth US $ 318 million for the development of the railway sector in Sri Lanka in June 2017. The Ports and Shipping Ministry has identified that the rehabilitation of KKS harbour would contribute to promote traditional commercial linkages, both domestic and regional and give an incentive to economic activities by encouraging trade in northern Sri Lanka. KKS will be the nearest port for all eastern ports in India, as well as for Myanmar and Bangladesh. Preliminary hydrographic survey, geotechnical investigation, preparation of a detailed project report and wreck removal and disposal dredging work at KKS harbour have already been completed under previous grant assistance from the Indian government. The fresh assistance of US$45.27 million would be used for the remaining two phases involving works relating to the rehabilitation of the breakwater and existing pier. Construction of a new pier for commercial cargo handling, installation of port infrastructure facilities will also be undertaken under this credit line facility. The Sri Lanka Ports Authority under the supervision of the Ports and Shipping Ministry will implement the project.